Note: For current resort prices, please see the main Room Rates page. The following nightly charges were based on Disney’s published “rack rates” for all the Walt Disney World Moderate Resorts — i.e. this is the rate you would have been charged if you called the Disney Reservation Center and were not entitled to any special discounts. Disney bases the room charge on up to two adults per room. For each additional adult (aged 18 or over) there is a $15 per night surcharge. Additional children are free. Prices are quoted in US Dollars and do not include the 12.5% Florida resort tax which must be added to any booking. From 2008 onwards, Disney introduced a per-night pricing structure which meant that each night of a stay may be charged at a different rate, as opposed to the block system used previously. For example, Friday and Saturday nights are now generally more expensive than weeknights, etc. Also, some public holidays such as Independence Day and Thanksgiving are charged at a premium rate. Thus the total cost of any vacation stay is now calculated on a night-by-night basis. 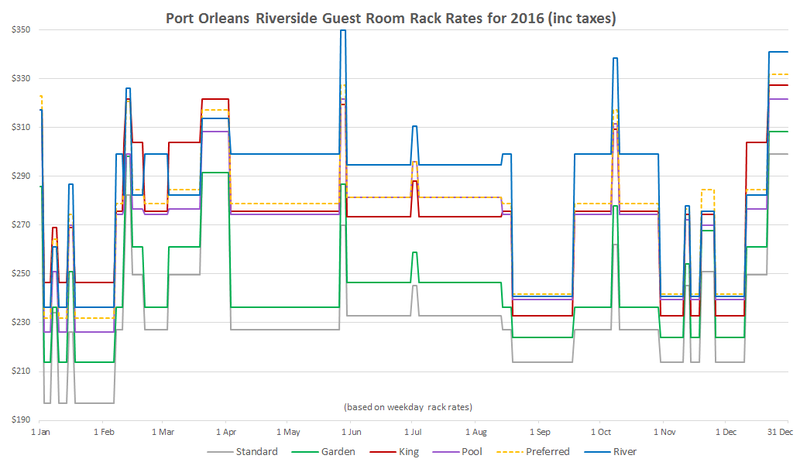 The USA ‘rack rates’ for Rooms and Packages in 2017 were released at 6am EDT on Tuesday 21 June 2016, roughly the same time that they were issued last year. The average room prices for 2017 at Port Orleans went up by 7.1% compared with last year’s rates, and by 12.1% compared to two years ago. 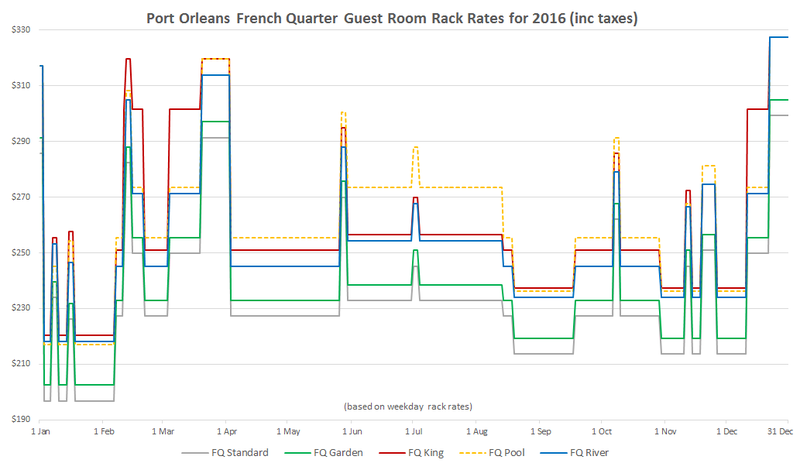 French Quarter was hit the hardest, with some room categories, such as King Bed, seeing a nearly 12% average increase since 2016. And for the first time ever there are no rates lower than $200, the starting point for a Standard room in 2017 being $213 (inc tax). That’s some inflation rate they’ve got down there in Florida! 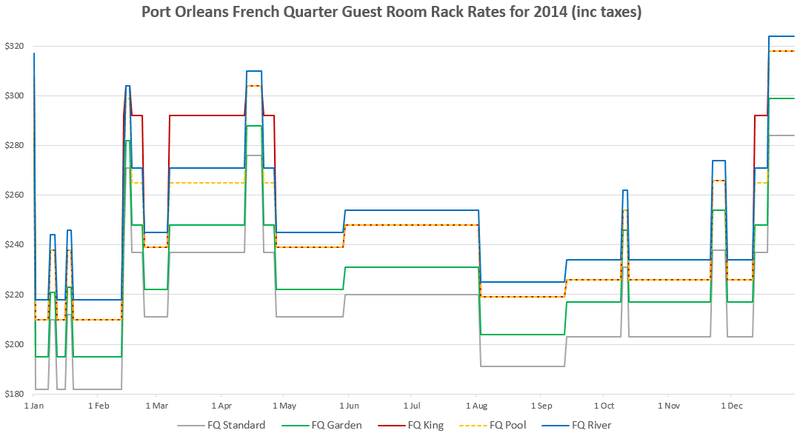 The overall tiering at French Quarter seems to have settled into a new pattern too, with River View rooms now considered to be a mid-tier rate, and King Bed and Pool View firmly at the top level. Presumably this is demand-based, as King Bed rooms at French Quarter always guarantee a corner room, and Pool View rooms are all very conveniently located for access to the main building, bus stop, and ferry dock — almost like a Preferred Location option. The original heavy differentials for Royal Rooms have now been almost completely eroded, with Garden, Pool and River views mostly selling at the same nightly rate, and even then only around $6 more than standard Royal Rooms. So if you are planning a Royal Room vacation, it’s definitely worth considering a Pool View (for the guaranteed convenient location) or a River View. There is no separate price point for Independence Day this year, so the Summer rate lasts for a full two and a half months from May 29 to August 12. Some room categories now feature weekend pricing during the Summer period, although most are still block-priced as in previous years. And even more strangely, in several categories (such as Preferred Location rooms and all of the Royal Room options) weekend nights during Summer are actually priced lower than the surrounding weekday rates, rather than the normal $30 or so hike for Friday/Saturday nights. I do wonder if this might be an error? 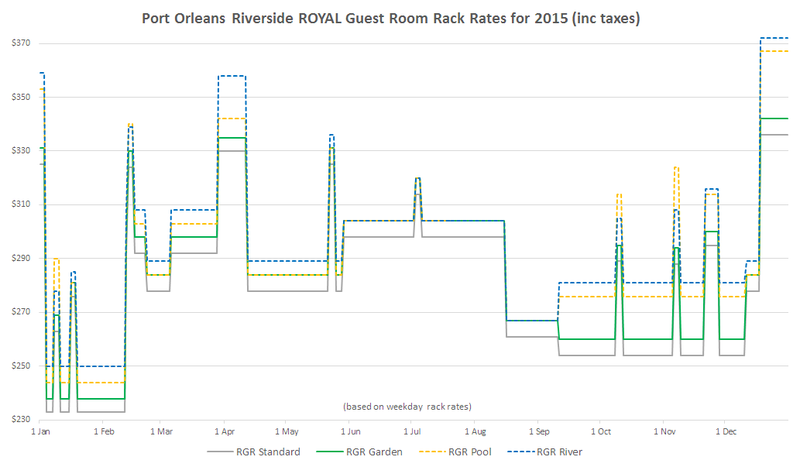 Once again, Memorial Day appears to be an anomalous blip at Riverside, significantly more expensive than even Christmas week at $383 per night for a River View room — a full $70 more than a similar River View room at French Quarter for the same nights. Regular Guest Room Booking Categories (excludes the Royal Rooms located in Riverside’s Oak Manor and Parterre Place mansion buildings). Standard: These rooms mostly tend to face towards parking lots, or have partially obscured views (such as beside stairways, etc). Standard view rooms are located all around the resort, EXCEPT for Preferred Locations. From 2019, this category will probably only be offered for parties of up to four guests (aged 3+) and for Riverside it will most likely get you a room in one of the mansion buildings (80 or 85) although that is not absolutely guaranteed. 2017 prices vary seasonally from $213 to $323. Garden View: These rooms offer pleasant views of the gardens, courtyards (including water features and fountains), landscaping, trees or bayou — but NOT of the parking lots. Garden View rooms can be located in any of the buildings EXCEPT for Preferred Locations. From 2019, this category will probably only be offered for parties of up to four guests (aged 3+) and for Riverside it will most likely get you a room in one of the mansion buildings (80 or 85) although that is not absolutely guaranteed. 2017 prices vary seasonally from $226 to $330. Standard View — Fifth Sleeper: This category is new for Port Orleans Riverside in 2019 and regardless of your party size it will guarantee you a room in the Alligator Bayou section with an extra fold-down bed. These rooms mostly tend to face towards parking lots, or have partially obscured views (such as beside stairways, etc). 2017 prices vary seasonally from $213 to $323. Garden View — Fifth Sleeper: This category is new for Port Orleans Riverside in 2019 and regardless of your party size it will guarantee you a room in the Alligator Bayou section with an extra fold-down bed. These rooms offer pleasant views of the bayou, gardens or trees — but NOT of the parking lots. 2017 prices vary seasonally from $226 to $330. Preferred Location (Alligator Bayou section ONLY): These rooms offer close proximity to the restaurants, transportation and main buildings at Riverside. Preferred rooms are ONLY located in Alligator Bayou lodges 14, 15, 18 or 27 — there are no preferred locations in the mansion buildings or at French Quarter. Views vary and can include parking lot or bayou/stream/garden outlooks — but not pool/river views. 2017 prices vary seasonally from $264 to $358. King Bed: These rooms feature one King-size bed only, and have a maximum occupancy of two persons (or three if you are in the Alligator Bayou section only, due to the extra fold-down bed). Views and locations vary around the whole of the resort, and some can feature pool or river views or may be the within ‘preferred’ buildings, however they are still booked under the King Bed category. Note: there are no King Bed rooms in the Royal Guest Room buildings. 2017 prices vary seasonally from $264 to $350. Pool View: These rooms offer swimming pool views and are spread out all around the resort, for example French Quarter buildings 2 or 5, and Riverside 16, 17, 18, 24, 25, 35, 36, 39, or mansion buildings 80 and 85. (Note: only six Pool View rooms at French Quarter are on the ground floor, most are on the upper floors) 2017 prices vary seasonally from $233 to $349. River View: These rooms offer direct views of the Sassagoula River, including some mansion building rooms which view the river across courtyards or lawns. They do not guarantee any particular proximity to the main buildings — however at Riverside, all of the directly river-facing rooms tend to give fairly convenient access to the facilities areas anyway. River View rooms can be located in French Quarter buildings 1, 2, 5, 6 or 7, and Riverside 14, 27, 38, or mansion buildings 80 and 85. 2017 prices vary seasonally from $230 to $383. Royal Guest Room, Standard: These are the cheapest of the Royal Guest Rooms and generally face towards parking lots, or have partially obscured views (such as beside stairways, etc). 2017 prices vary seasonally from $266 to $383. Royal Guest Room, Garden View: These rooms offer pleasant views of the gardens, courtyards (including water features and fountains), trees or landscaping — but NOT of the parking lots. 2017 prices vary seasonally from $271 to $388. Royal Guest Room, Pool View: These rooms face towards the nearby leisure swimming pool, and they are all very conveniently located for easy access to the main buildings. 2017 prices vary seasonally from $271 to $392. Royal Guest Room, River View: These rooms offer direct views of the Sassagoula River, including some rooms which overlook the courtyards or lawns in front of the river. However at these prices some people have commented that you could stay at a Deluxe resort. 2017 prices vary seasonally from $271 to $392. Note: Alligator Bayou is the ONLY section which contains additional fold-down beds. If your booking includes five people aged 3 or older, you will automatically be assigned an Alligator Bayou room. There are no Royal Guest Rooms which allow this. There is no dual-classification between the various booking categories, each room falls into one specific band only. Thus all rooms with a king-size bed are classed as “King Bed” rooms, even if they also happen to be in Preferred Location buildings or may have pool or river views. Similarly, non-King rooms with views overlooking the river — even in the Preferred buildings — count as “River View” rather than Preferred. The same policy applies for the six Pool View rooms in building 18. The booking categories for every room at the resort are listed on the Building Floorplan Maps page. So for example, if you wanted to try to get a king bed room with a pool or river view, you should book a King Bed category, and then add a request for a Pool/River View if available. The same applies if you want a River View in a preferred buildings; book for River View and then add a request for a close location. See the Making Special Room Requests page for more details. The USA ‘rack rates’ for Rooms and Packages in 2016 were released at 6am EDT on 22 June 2015, more than a month earlier than they were issued last year. Prices vary from $196.88/night for the cheapest Value rate Standard View rooms up to $378/night for a Pool View Royal Room at Christmas time. There is no longer any predictable pattern as to which room type will be the most expensive because the tier spacing now varies seasonally based on expected demand — however Standard View and then Garden View are generally the cheapest. 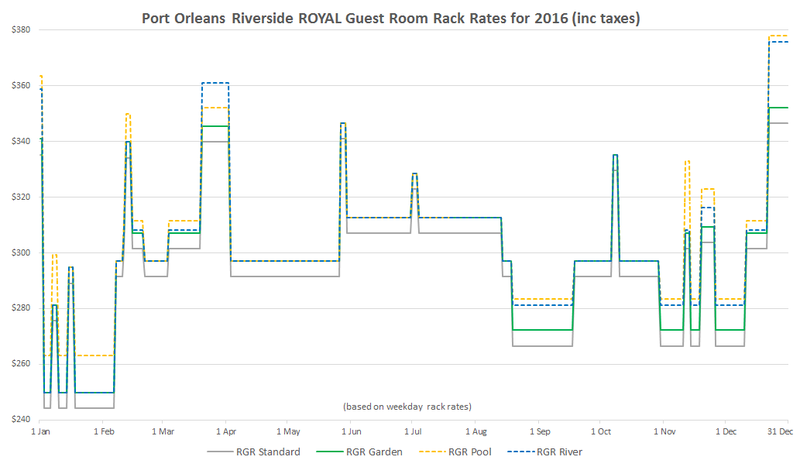 The average increase from last year’s rack rates is 4.69% (French Quarter accounting for about 4.27% of this, with Riverside slightly higher at nearly 5%). However the biggest shocker of all comes when you contrast the daily rates for the traditionally lower-priced months of September and October. For example at Port Orleans Riverside, the premium categories such as Pool View, Preferred Location and River View have risen by as much as 27% in 2016! 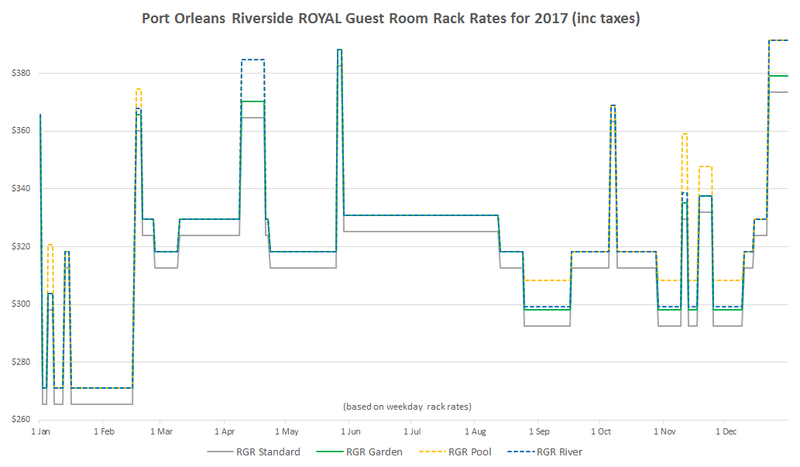 A River View room would have cost you $236 per night for October 2015, whereas in October 2016 the exact same room will cost $299 — a massive 26.7% increase. Given that this is (no doubt completely coincidentally) the same period that the Disney Dining Plan is offered for free, it does rather confirm the old truism that “There Ain’t No Such Thing as a Free Lunch”. So Disney’s new prices don’t seem exactly in tune with America’s current negative inflation rates, or its reduction in average hourly earnings — all of which may make staying on-site at Disney a significantly more expensive option in real terms for many people. However as long as people still keep coming to Disney, as a business with a responsibility to shareholders, they will continue to increase prices as much as they feel they are able to get away with. As someone else said, “in other breaking news, water is wet and the sky is blue”. 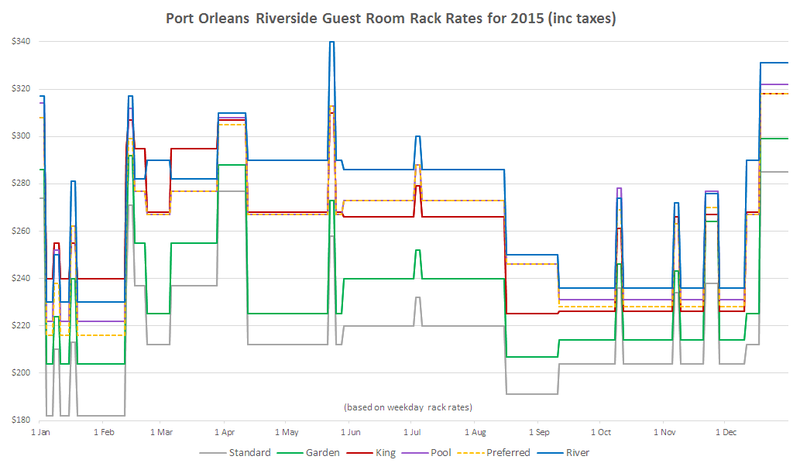 Apart from the September/October rates mentioned above, no real surprises this year for the Port Orleans Riverside regular rooms, the price tiering remains fairly close to what we have been used to for several years. For some reason, River View rooms during Memorial Day weekend are again more expensive even than Christmas — and more than $80/night dearer than Standard View rooms for the same weekend. The premium nature of the various Royal Guest Room categories continues to stay pretty flat compared to the tiering that was in place when the Royal categories were first introduced back in 2012. There is often very little difference between the price of Standard View Royal Rooms and the various higher categories — and at many times of the year, Garden, Pool and River views are all exactly the same price. The most expensive option of the entire year at Port Orleans would actually be a Pool View Royal Guest Room during Christmas week, which in 2016 will set you back a whopping $378 per night. 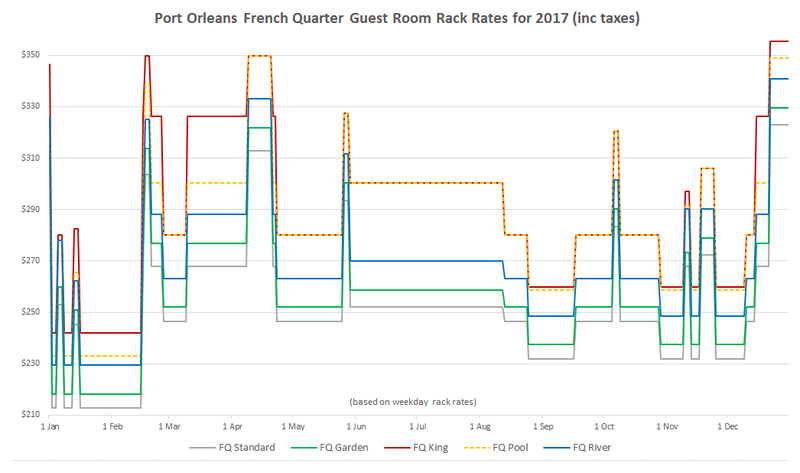 For some reason, Pool View and King Bed rooms at French Quarter are now mostly more expensive than the previously top-tier River View rooms. I guess I can understand the Pool View premium price as those rooms give an excellent guarantee of proximity to the main building and also to the bus stop and boat dock, but I’m not sure why King Bed should have followed suit too. Maybe people are starting to realise that you can legitimately request any view type that you want when you book a King Bed room? 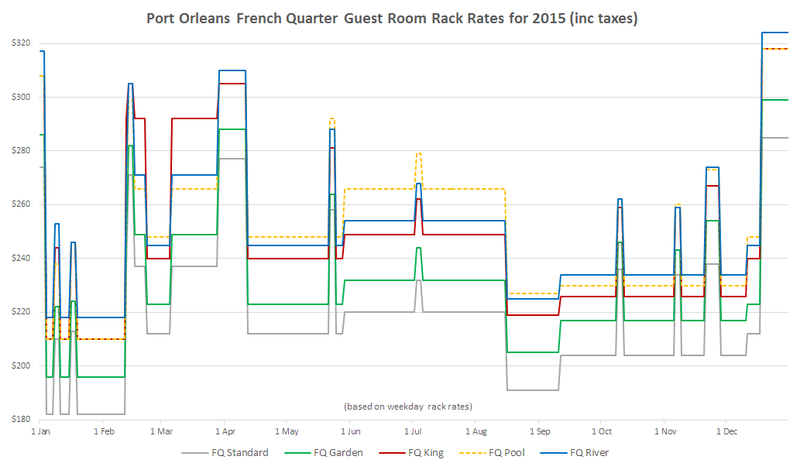 Note: Initially, French Quarter’s Garden View rooms were showing as cheaper than Standard View rooms for most dates, but that disparity has now been addressed and the Garden View rates have been adjusted — although the Seasonal Calender pages currently still show the original figures. I hope that some people managed to follow my early advice and got their bookings in before the rates went up. Walt Disney World released their 2015 room and package rates via the booking website on 30 July 2014. Walt Disney World released their 2014 room and package rates via the booking website on 10 July 2013. No new booking categories were introduced since the 2013 updates. The 2014 rates were much more complex and convoluted than in previous years, with no clearly discernable pattern to the incremental charges when moving from one booking category to another. There also seemed to be some odd discrepancies within the pricing of King Bed rooms — sometimes they were cheaper than Pool/Preferred rooms, sometimes more expensive. 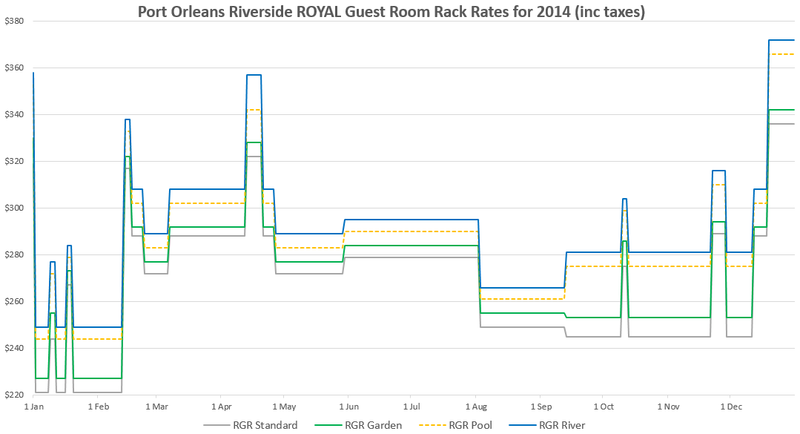 Summer King Bed rates at Riverside seemed remarkably cheap in comparison to other periods, while at French Quarter in Peak season only, King Beds were more expensive than River View! In some seasons, there was as much as a $46 jump from a Standard room to a River View room, and up to $90 to go up to a River View Royal Guest Room. Ouch! Walt Disney World released their 2013 room and package rates via the booking website on 11 July 2012. All of the Port Orleans rooms have recently been refurbished (completed 1st August 2012) and feature either two Queen sized beds or one King size bed. Riverside’s Alligator Bayou section also features an extra fold-down Murphy bed (approx. 63" x 30") over the banquette bench seat, suitable for a child or small adult. Specially themed Royal Guest Rooms are available in Oak Manor and Parterre Place at Port Orleans Riverside. Please see the Guest Rooms page for further descriptions of the room amenities, photos and a detailed room plan layout. There is no dual-classification between the various booking categories, each room falls into one specific band only. Thus all rooms with a king-size bed are classed as “King Bed” rooms, even if they also happen to be in Preferred Location buildings or may have pool or river views. Similarly, non-King rooms with views overlooking the river — even in the Preferred buildings — count as “River View” rather than Preferred. The same policy applies for the six Pool View rooms in building 18. So for example, if you wanted to try to get a king bed room with a pool or river view, you should book a King Bed category, and then add a request for a Pool/River View if available. The same applies if you want a River View in a preferred buildings; book for River View and then add a request for a close location. See our pages on Room Categories and Locations and Making Special Room Requests for more details. All rooms located within the Alligator Bayou section of Riverside feature an extra fold-down Murphy bed (approx. 63" x 30") located over the banquette bench seat (at no extra cost) and thus these rooms have a maximum occupancy of five people. No other rooms within the resort have the option of an extra bed. The King Bed rooms within the Alligator Bayou section (only) also feature the same extra fold-down Murphy bed and thus these rooms have a maximum occupancy of three people. In May 2013, the online reservations system was enhanced to finally allow this three-person option to be booked. Standard: These rooms mostly tend to face towards parking lots, or have partially obscured views (such as beside stairways, etc). Standard view rooms are located all around the resort, EXCEPT for Preferred Locations. Garden View: These rooms offer pleasant views of the gardens, courtyards (including water features and fountains), landscaping or bayou — but NOT of the parking lots. Garden View rooms can be located in any of the buildings EXCEPT for Preferred Locations. $10 per night surcharge. Preferred Location (Riverside, Alligator Bayou only): These rooms offer close proximity to the restaurants, transportation and main buildings at Riverside. Preferred rooms are ONLY located in Alligator Bayou lodges 14, 15, 18 and 27 — there are no preferred locations in the mansion buildings or at French Quarter. Views vary and can include parking lot or bayou/stream/garden outlooks — but not pool/river views. $25 per night surcharge. King Bed: These rooms feature one King-size bed only, and have a maximum occupancy of two persons (or three in the Alligator Bayou section only). Views and locations vary around the whole of the resort, and some can feature Pool/River Views or are within Preferred Locations (these all still fall under the King Bed booking category though). Limited quantities are available, and there are no King Beds available at all in the Royal Guest Room buildings. $25 per night surcharge. Pool View: These rooms offer swimming pool views and are spread out all around the resort, for example French Quarter buildings 2 & 5 (note: not on the ground floor at French Quarter), Riverside 16, 17, 18, 24, 25, 35, 36 and 39, plus the mansion buildings. $25 per night surcharge. River View: These rooms offer direct views of the Sassagoula River, including some rooms which overlook the courtyards or lawns in front of the river. They do not guarantee any particular proximity to the main buildings — however at Riverside, all of the directly river-facing rooms do tend to give fairly convenient access to the facilities areas anyway. River View rooms can be located in French Quarter buildings 1, 2, 5, 6 and 7, or at Riverside in Alligator Bayou lodges 14, 27 and 38 plus the mansion buildings. $30 per night surcharge. Note: There are a few odd discrepancies in the pricing for two seasons this year. 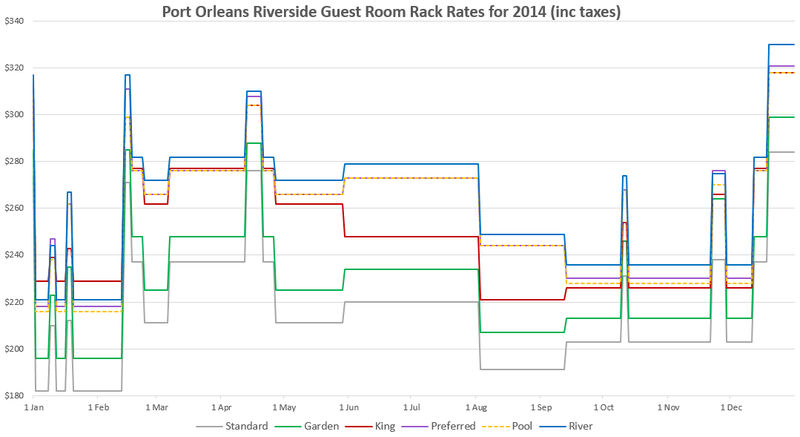 For some reason, the tariff card shows Riverside as being $2/night more expensive than French Quarter for the Garden/King/Preferred/Pool/River categories in both Regular and Value(2) seasons. 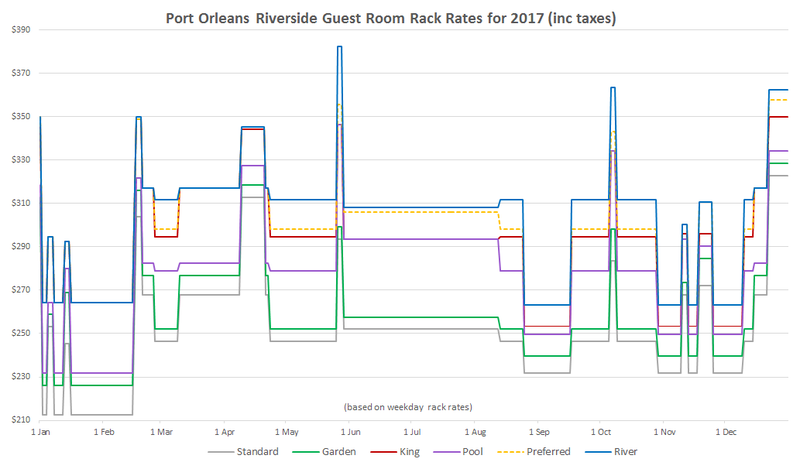 For all other time periods, Riverside and French Quarter have exactly the same pricing, just as they have done in the past. This could just be a typo, but both prices are listed here for reference. Royal Guest Room: These are the cheapest of the Royal Guest Rooms and generally face towards parking lots, or have partially obscured views (such as beside stairways, etc). Royal Guest Rooms start at approximately $30 more than regular rooms at the resort. Royal Guest Room Garden View: These rooms offer pleasant views of the gardens, courtyards (including water features and fountains) or landscaping — but NOT of the parking lots. $40 per night surcharge over a regular resort room. Royal Guest Room Pool View: These rooms face towards the nearby quiet swimming pool, and they are all very conveniently located for easy access to the main buildings. $55 per night surcharge over a regular resort room. Royal Guest Room River View: These rooms offer direct views of the Sassagoula River, including some rooms which overlook the courtyards or lawns in front of the river. However at these prices some people have commented that you could almost stay at a Deluxe resort. $60 per night surcharge over a regular resort room. Note: There are no King Bed options in the Royal Guest Rooms, presumably because these rooms are aimed directly at families rather than couples. Also, there are no Royal Guest Rooms which allow for an additional bed to sleep an extra person. The 2012 room rates were release via the booking website on 12 June 2011. New for 2012 were the Port Orleans Riverside “Royal Guest Rooms” in both Oak Manor and Parterre Place, with the first such rooms being opened on 9 March 2012. There are no King Bed or Preferred Location rooms in the Royal buildings. Disney also introduced yet another room category — Garden View — into the already complicated and increasingly pricey mix. People opting for a Standard room are now most likely to end up with a parking lot view. As part of a resort-wide refurbishment program, all of the Alligator Bayou rooms now feature a fold-down Murphy Bed rather than the old trundle beds. The refit took place during 2011/12 and was completed on 1st August 2012. Preferred Location (Riverside, Alligator Bayou only): These rooms offer close proximity to the restaurants, transportation and main buildings at Riverside. Preferred rooms are ONLY located in Alligator Bayou lodges 14, 15, 18 and 27 — there are no preferred locations in the mansion buildings or at French Quarter. Views vary and can include parking lot or bayou/stream/garden outlooks. $25 per night surcharge. King Bed: These rooms feature one King-size bed only, and have a maximum occupancy of two persons. Views and locations vary around the whole of the resort, and some can feature Water/River Views or are within Preferred Locations (these all still fall under the King Bed booking category though). Limited quantities are available, and there are no King Beds available at all in the Royal Guest Room buildings. $25 per night surcharge. Water View: These rooms offer swimming pool views and are spread out all around the resort, for example French Quarter buildings 2 & 5 (note: not on the ground floor at French Quarter), Riverside 16, 17, 18, 24, 25, 35, 36 and 39, plus the mansion buildings. $25 per night surcharge. Royal Guest Room Water View: These rooms face towards the nearby quiet swimming pool. $55 per night surcharge over a regular resort room. Standard View: General views of the landscaping, courtyards or gardens (including the bayou area at POR). Could include rooms which face towards parking lots. Water View: Swimming pools or other water features. $25 per night surcharge. King Bed: One king-size bed only, with a maximum occupancy of two persons. Views and locations vary around the whole of the resort. $25 per night surcharge. Preferred Room (Riverside only): Close proximity to the restaurants, transportation and main building. Preferred room are located in Alligator Bayou lodges 14, 15, 18 and 27 only (there are no preferred rooms located in the mansion buildings). $25 per night surcharge. River View: These rooms offer direct views of the riverfront, but do not guarantee any particular proximity to the main buildings — however at Riverside, any of the directly river-facing rooms tend to give fairly convenient access to the facilities areas anyway. $30 per night surcharge. All non-King rooms featured two double or queen sized beds. Queen beds were installed in all French Quarter rooms during 2011, and Riverside’s upgrade started in June 2011. Riverside’s Alligator Bayou double-bedded rooms also featured an extra pullout “trundle bed” suitable for a child or small adult. Standard View rooms feature two double beds. Double rooms located within the Alligator Bayou section of Riverside also feature an extra pullout “trundle bed” at no extra cost and have a maximum occupancy of five people. Water View rooms have either a river or a pool view. King Bed rooms feature one king-size bed only and have a maximum occupancy of two persons. * Note: In 2010, Thursday January 7 (Marathon weekend) and Sunday October 10 (Columbus Day weekend) were charged at Weekend rates, not Weekday. Prior to 2008, the price for an entire stay was based on the costing for the first night — for example, an entire two-week Christmas stay commencing on 19 December would have been charged at Value season rate instead of Holiday — bargain! The 2007 seasonal structure is given below for reference, but the dates were broadly similar in previous years too.